This was a common T Shirt around campus. 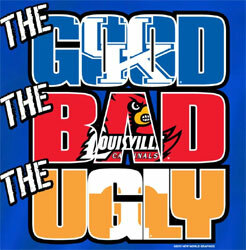 Sometimes the “bad” was Tennessee and the “ugly” was Louisville. Other times the Florida Gators or Auburn Tigers would be on the shirt. However, Kentucky never moved (and will never move) from that top spot and for very good reasons (not that I am biased or anything). I know I just posted an article the other day, but this market has been a little unsettling. There has been a lot of negative news flow, comparisons to the market malaise of 2008, and that this is a bear market all over again. So, let’s set the record straight. Over the last 36 years, the stock market has had positive returns 27 of those years. That’s about 77% of the time. However, the stock market (as measured by the S&P 500) has been down 10% or more during 20 of those 36 years and those other 16 years the market was down 3-9% at any given point during the year (Factset). Just to throw one more statistic out there, of those 20 years where the stock market was down 10% or more, only 6 of those years resulted in negative performance. And I know some of you are thinking “this time is different,” well you are right. Every time the markets go through these bouts of volatility, the factors that cause the selloff are usually different. Tech stock bust, real estate bust, global terrorism, China slowing, plummeting oil and so on. But the end result, with enough patience, is typically a positive result. Let’s take a look at some of the factors, both economic and market related, that are driving the markets. Here in the US, employment numbers are still good. At a 5% unemployment rate (below the 6.2% historical average according to Factset) and wage growth improving (not back to average, but improving), our employment situation is much better than it was 5 years ago. The one sector that we are seeing the labor force shrink is in the oil sector, but we’ll touch on oil a little later. Another good thing is that the Fed finally made their first rate increase in 9 years! Good you may ask? YES! Because now we can stop talking about it and getting “scared” about it. And yet interest rates are still staying low! The Fed increase has not impacted consumer rates as everyone feared, so for the time being mortgages and other rates are still at historically low levels. A heart surgeon in Florida saved an infant who was born with one lung and half of a heart using a $20 Google Cardboard product and virtual reality imaging on a phone. That’s pretty amazing if you ask me. China, oil and market volatility. Need I really say more? The headlines out of China are the same as they were in August. Slower GDP growth and devaluation of their currency have been the main factors affecting the global markets. Slower GDP means that they are consuming less and could potentially be a negative impact on the global GDP. Mind you that China slowing has a very minimal impact on the US directly…exports to China are less than 1% of our GDP (Goldman Sachs). Oil prices are great for the consumer, bad for the oil sector. I’m not going to guess where oil is going, but if demand continues to be weak (slowing China) and OPEC keeps production levels the same, our oversupply is going to continue and prices will not strengthen. One thing outside of the simplicity of the supply/demand argument is the strength of the US Dollar. If the dollar weakens, the price of oil could rise. The market volatility is going to force me back on my acid reflux medication. Jeez. From the analysts I read, there is nothing fundamentally wrong with most US companies; therefore the selloff is more than likely overdone. My ugly category is really reserved for things like H-Bombs, nuclear meltdowns, terrorist attacks, the Tennessee Vols (just kidding, sorry Jill) and catastrophic weather related events. There is no predicting these events, but we know they happen. Matter of fact there were two terrorist related events today, January 7, 2016 (at least that were reported); one in France on the anniversary of the Charlie Hebdo shootings and a suicide bomber in Libya. When will this madness stop? “Don’t wanna be an American idiot. Keep calm and carry on. Still not settled? Drop me a line.